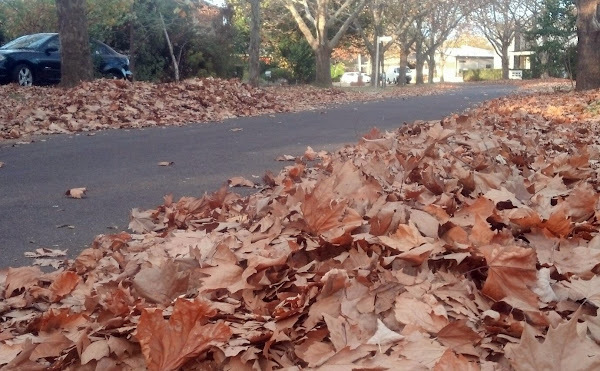 It’s a good thing we’re not putting the leaves in the gutter isn’t it? As seen in Dickson over the weekend. I’m sure many already know this but I’ve discovered that a couple of quick runs up and down the road with a lawnmower and grass catcher (left side to the kerb, max height setting on the first run and then lowest setting on the second run) picks up nearly all of the leaves and mulches them very nicely for the compost or straight onto the garden beds. It looks a bit silly mowing the street but it seems to work really well. The government plants these trees on their nature strips and then moans when they drop leaves. Apparently it’s not just us who are clogging the storm water drains. Call me daft, but perhaps the rangers/parks and gardens could come past with a trailer and pick them all up?